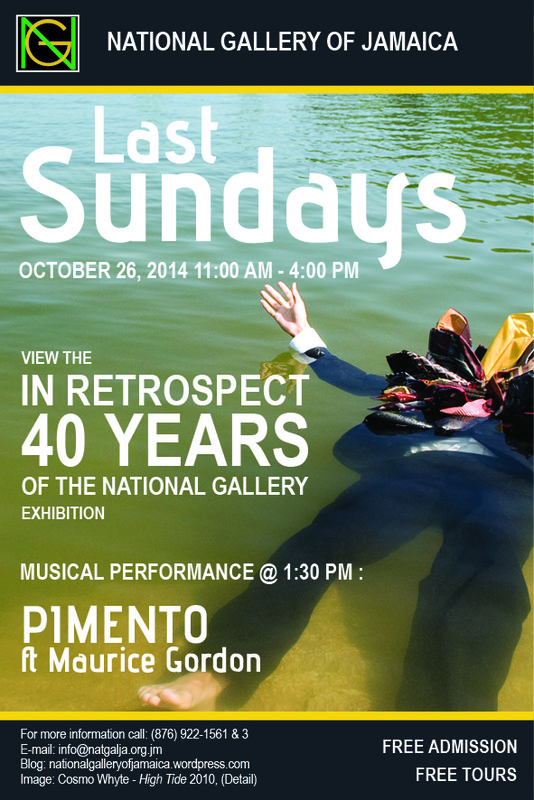 The National Gallery’s Last Sundays programme for October 2014 is scheduled for Sunday, October 26, from 11 am to 4 pm, and will feature the In Retrospect: 40 Years of the National Gallery of Jamaica exhibition and a musical performance by the Pimento trio, featuring Maurice Gordon. The In Retrospect: 40 Years of the National Gallery of Jamaica exhibition opened on August 31 and represents the first major event in the National Gallery’s 40th anniversary celebrations. In Retrospect tells the story of the National Gallery through its exhibitions and publications, through major donations, and through the debates that have surrounded the Gallery from its earliest years, with a special focus on the Gallery’s role in articulating how Jamaican art is understood. The exhibition consists mainly of key works from the Gallery’s collection and invites viewers to respond to these works in the context of the National Gallery’s own history. In Retrospect closes on November 15 and is thus in its final weeks. The Pimento trio, which is scheduled to start at 1:30 pm, plays contemporary jazz, flavored with hints of reggae, R&B, funk, rock and fusion. The trio is headed by the noted guitarist and composer Maurice Gordon, who is acclaimed for his fluid technique, dexterity and highly personal style and cites as his influences Charlie Christian, Wes Montgomery, Miles Davis, George Benson and Bob Marley. Maurice Gordon has performed at festivals in the Caribbean including Jamaica Jazz and Blues Festival, St. Lucia and Martinique Jazz Festivals, Ramajay Festival (Trinidad), Grenada Spice Jazz Festival. As is now customary for Last Sundays, admission to the NGJ will be free on Sunday, October 26, and guided tours and children’s activities will also be offered free of cost. Our gift and coffee shop will be open for business and contributions to the donations box are welcomed. Revenues from our shops and donations help to fund programmes such as the In Retrospect exhibition and our Last Sundays programming.